I am continually astounded by the number of very ordinary dishes I have never made. So many classics have completely slipped by me. The past weeks in particular have shown that I have only scraped the surface of classic dishes from my own narrow cultural culinary experience. On our trip last month we put together a list of some meals that we needed to make. It's sort of like a bucket list except instead of being things to do before you die it's things to cook . . . eventually. It's like a bucket list for unambitious people who are afraid to make a commitment. Tonight's classic: deep dish pizza. Before I made the pizza I put out this simple salad with beet greens, cooked beets, pecans, lemon juice, olive oil, salt, and pepper. It was similar to last night's salad except I did not add any kale. 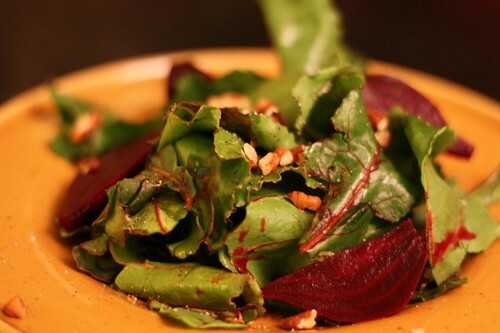 It's amazing how tender other salad greens are when you've grown accustomed to eating kale on a daily basis. It's sort of like when Goku trains with King Kai on the planet with ten times the gravity then returns to Earth and feels light as a feather. If there is a beet greens eating competition in any future Olympics I am going to represent my country and I will train by eating kale. If there's a kale eating competition I'll train by eating lead foil. For the pizza I used this meat sauce I made the other day. I didn't blog about it because I found it far too boring to mention. 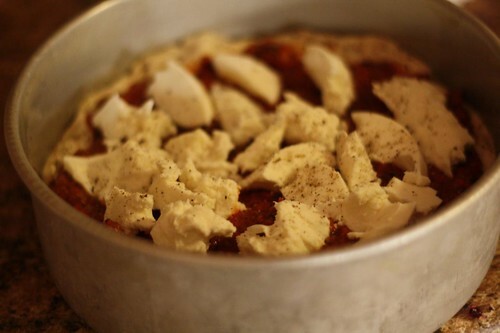 However, I thought this would make a perfect base for my deep dish pizza. I simply lined a pan with some dough which I allowed to rise, put a liberal amount of sauce on, and topped it with fresh mozzarella. This made it just about the easiest dinner I could possibly make. The only pan I had was a little too small for the dough so it ended up being a little deeper dish than I would have liked. 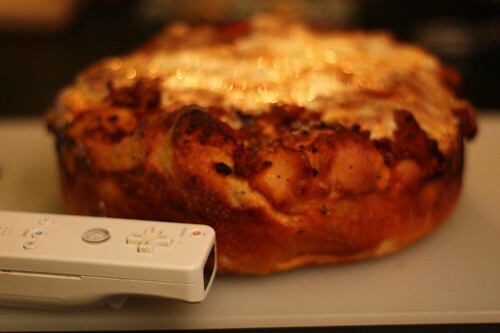 Here is the pizza with a Wii Remote for scale. 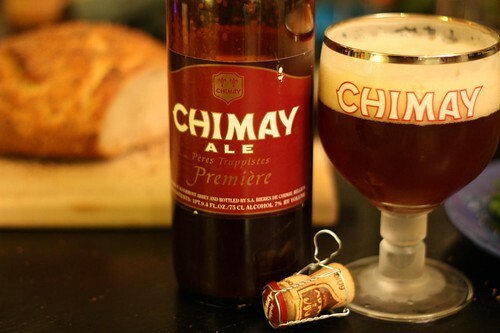 We had a huge ice storm overnight and after spending much of the morning chipping away at the ice surrounding everything in my life, salting the walkway, driving our neighbor and Jen to the train, leaping over puddles to reclaim my car, and just generally suffering I decided to have some Chimay. 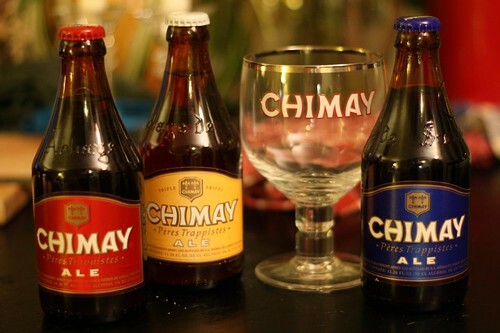 I'd purchased this gift pack for myself for Christmas but I found that this was not going to be sufficient. Instead I opened one of the larger bottles which I thought would make me happier. It turns out I was right. Also pictured is the loaf of bread I made for no good reason. Totally unnecessary with such a massively deep dish pizza which was basically a large loaf of bread with some sauce and cheese on it. Since we never like to miss an opportunity for a culinary or cinematic tradition we took the opportunity to watch Groundhog Day tonight. I hate Groundhog Day. Not the movie, the actual day. I find the whole thing intolerable. 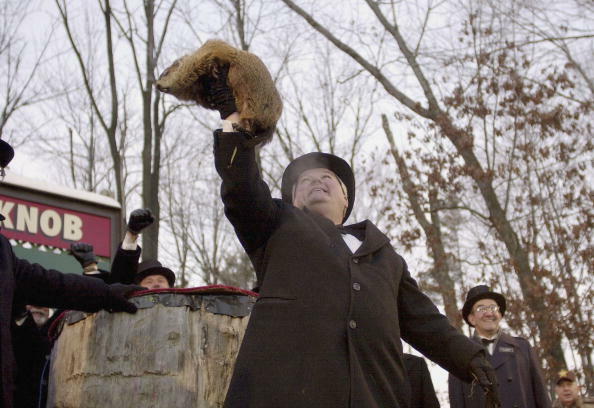 Watching stupid men in top hats with waxed mustaches manhandle a poor woodland creature is not my idea of a tradition that has any place in the 21st century. It's about on par with the presidential pardon of the turkey where both the turkey, and the president, look like they'd rather be somewhere else. Of course the thing about Groundhog Day is that the men in in the top hats do not look like they'd rather be anywhere else. They seem to be enjoying it to an extreme. The groundhog, on the other hand, is secretly plotting the Groundhog Uprising of 2018 where the humans will be very, very sorry for all that they have done. The whole thing is just a big mess. 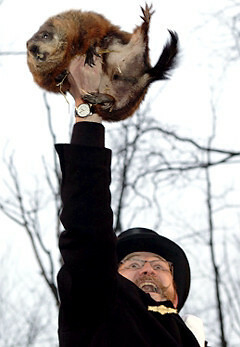 I think the first Groundhog Day celebration is the day that hipsters were invented. These men are hipsters. Middle-age hipsters. Then there's the crowd. Those who would watch this nonsense at home or read about it online and discuss the outcome is a special kind of food. But then there's the crowd. Take a good look at the faces in that crowd. 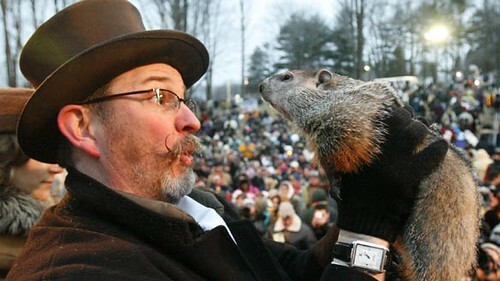 Anyone that would wake up before dawn and stand in the freezing rain for hours to wait for some men dressed up in period garments and tell us what they think a groundhog has determined about how long one of the Earth's seasons is going to last is someone that cannot be trusted. Take note of those people and avoid any professional or personal relationships with them in the future. That's just good business. Then there's everyone talking incessantly, all day on February 2nd, about how it's going to be an early spring or a late spring . My guess is that there's going to be exactly 46 days of winter before spring begins. I'll go as far as to say I'm certain of it because spring begins on March 20th regardless of whatever some chubby rodent in Pennsylvania did this morning. 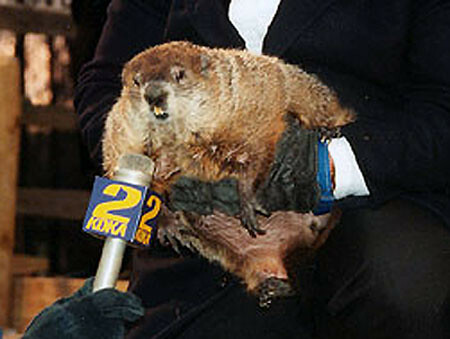 It's not that I have any great love for groundhogs or that I'm some crazed animal activist. In fact my father taught me to loathe groundhogs. I would often be woken up on summer mornings as a child to the sound of gunshots specifically aimed at groundhogs. This was followed alternately by triumphant cries or four-letter expressions of disdain. 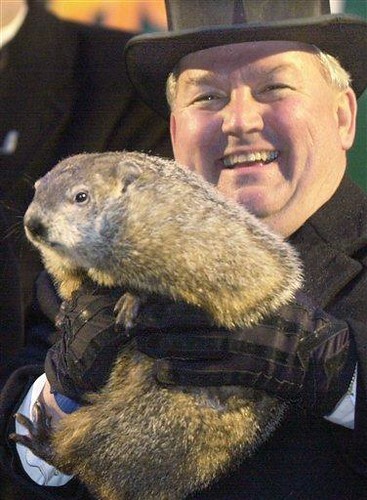 I would hazard a guess that the groundhog isn't too happy about any of this either. I don't know enough about animal psychology to know if groundhogs have a distinct sense of humiliation but I can only hope, for their sake, that they do not. 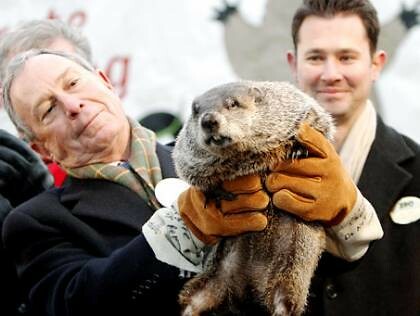 The groundhog is probably the only one more annoyed by this whole indignity than me. I think we can all agree, as a people, that there is no place for this ridiculous ceremony in civilized society. Did you know that they come up with the outcome of the shadow sight BEFORE February 2nd? What kind of crap is that? 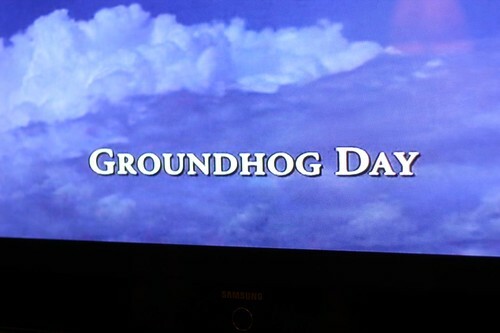 The movie is the ONLY thing good about Groundhog Day. Agreed! I didn't know about that! What a scam!